Three people this week have sent me this quote. Apparently it’s time. 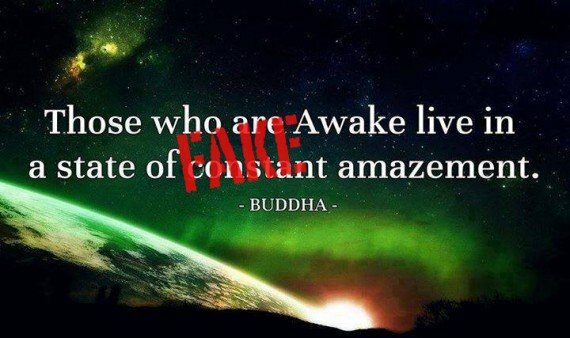 “Those who are awake live in a state of constant amazement” is not from the Buddha. It’s from Jack Kornfield’s “Buddha’s Little Instruction Book” (page 124). Jack may well have gotten this from the 1990 movie, Joe Versus the Volcano, which came out four years before “BLIB” was published. I don’t know whether he took it straight from that source, or whether someone else had misrepresented it as being a Buddha quote first. Alternatively, there could have been some other, as yet unknown, source that both the book and the movie were drawing on. The Buddha did often talk about various things being “amazing and astounding,” or “strange and wonderful” (translations vary). The phrase in Pali is “acchariyā abbhutā dhammā.” There are for example eight amazing and astounding things about the ocean, which parallel eight amazing and astounding things about the Sangha. But it’s not at all clear that the Buddha found these things personally amazing, and it’s more likely, I think, that he thought these were things that, if brought to his audience’s attention, would be amazing and astounding for them. I don’t pretend to know what the Buddha’s experience was like, but if he went around in a state of constant wonder then that fact wasn’t, to the best of my knowledge, recorded in the scriptures. Thanks. That information was previously in the comments, but got lost when the site was hacked earlier this year. I’ll edit the article to incorporate the reference.